Is Your Website Ready for #Mobilegeddon? Yes, we are making another blog post about the importance of having a mobile-friendly website with responsive web design. If you are tired of hearing about it, good news! 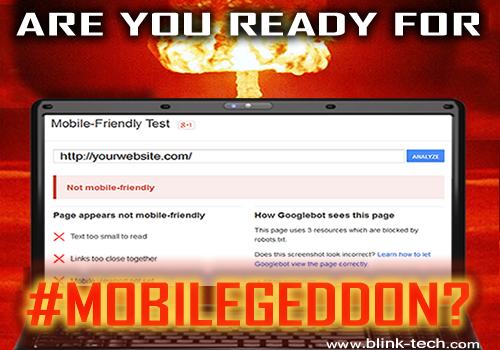 It will all be over after April 21, when the Internet faces what some are calling … #Mobilegeddon. On that day, you could lose a great portion of your website traffic. Don’t say we didn’t warn you! How do you know if your website will be affected by #Mobilegeddon? Have you visited your own website on a smartphone or tablet? Does it resize for the display and have a mobile-friendly menu? Is it easily navigable? If not, you could be facing the wrath of Mobilegeddon. The best and quickest way to tell if your site is on the mobile search chopping block is to use the Google Mobile-Friendly Test. Whether or not your website is mobile-ready, you should see this as an opportunity to get a leg up on your competition and make any needed changes. So, don’t forget to plug in your competitors’ websites into the Google Mobile-Friendly Test and see how they do. For large corporate websites that consist of thousand upon thousands of pages with a broad range of functionality, making the change from non-mobile to mobile-friendly is a major undertaking that can take months to roll out. I’m sure you’re thinking that big companies would be way ahead of the curve on this one, but you would be surprised. A recent Tech Crunch study found that 44% of the websites of Fortune 500 companies failed Google’s Mobile-Friendly Test. Pretty shocking! If your website doesn’t pass the Google Mobile-Friendly Test and you are facing Mobilegeddon, give us a call at 941-374-4546 or drop us an email! Mobilegeddon: Was It Worth All the Worry?